Getting feedback from members shouldn’t have to mean emailing everyone individually, counting up votes and chasing down responses. This spring, Wild Apricot launched a new Polls feature, so you can now ask questions and run surveys with your members, track their responses, and manage who can vote, all from your Wild Apricot admin account. This was one of the most highly voted for topics on our Wishlist Forum. 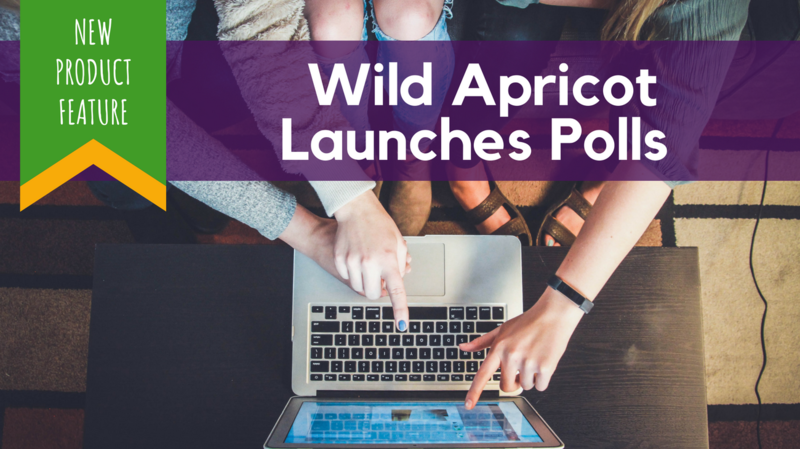 Whether you’re just hearing about this feature for the first time, or you’ve started using polls and still have some questions, I’ve included everything you need to know about Wild Apricot’s Polls feature. With this new feature, anyone with full administrator access can set up polls within the Wild Apricot software. They can then share these polls on their website, social media platforms, or in emails, where members can click on the link and answer the questions. 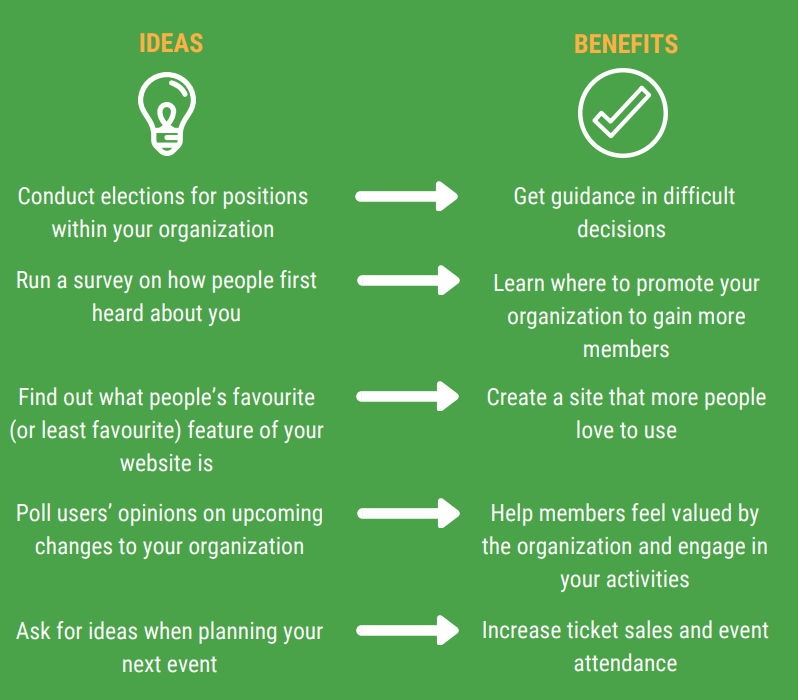 If you’d like to see how some organizations have been using the Polls feature (and how they’ve found their experience with it so far) you can do so on the Wild Apricot Membership Tribe Facebook page. For example, one organization set up a poll to survey ideas for an upcoming fundraiser. Other organizations have told me that they’ve used polls to get feedback after event, to choose a name for their new premises, and to vote for the yard of the month in their neighbourhood. It is worth noting that only members can vote in polls, although they can be Active, Pending Renewal, or Pending Level Change. Our system asks members to log in in order to vote so that each person can only submit their answers once, and the results aren’t skewed by people voting multiple times. Below is a screenshot from a simple sample poll I created. It took just 3 minutes to create! The Create poll screen that appears is divided into 3 tabs: General, Questions, and Access & settings. On these tabs, you can enter the poll title and description, the questions you want to ask your members, and the options they can choose for their answer. You can choose whether members can only select one answer, or multiple answers for the list. You can also add an option for ‘Other’, which brings up a text box where they can enter their own answer. From the Access & settings tab, you can control when your poll is visible and who can vote. You can decide how long the poll will be shown for by setting the start and end date of the poll under the Availability section. In the Access permissions section you can change who can see the poll, by restricting it to admins only or choosing specific groups of members. Once your poll is complete, you can preview and publish it, and share the link on your website and social media. When your members click on the poll link, they will be prompted to log in, if they are not already logged in. They will then be shown your poll question, and after they’ve cast their vote and clicked the Submit button, a summary of their vote will be displayed. Members can only vote once per poll, and neither members, nor administrators can change a vote after it is submitted. Within the poll list, you can see the status of your polls and the total number of responses so far. By clicking on the individual polls, you can see the number of people who have selected each answer. Are there any restrictions on who can use polls? You can modify polls for which voting has not yet begun – those with a status of Draft or Pending. Just click the Edit button within the poll details, and make your changes. You can duplicate any poll regardless of status: all questions and settings get copied, but responses do not get copied to the new poll. Click the three dots to the right of the poll you want to copy in the poll list, and select the Duplicate option. Can you see individual responses? It is possible to see individual responses, but this is available only by request. To turn on this feature, send an email from a full account administrator with your account number to support@wildapricot.com. How can I give feedback on additional features that I would like to see? Take a look at the Wild Apricot Wishlist to see if anyone else has suggested the same idea - you can find the forum here. If they have, you can vote for it to be on our development list. If your idea hasn’t been suggested yet, you can add it as a topic. For information on the full range of functions that the Polls feature includes, and more detailed instructions on how to use them, click here to visit our Help Site. If you have any questions, or need help setting up a poll, feel free to contact our support team. Please provide a way to re-order poll questions or insert new ones somewhere other than at the end of those already there.. Seems the only way to do this now is to just add them at the end or delete existing questions back to the insertion point and re-enter everything that comes afterward. It's not clear to me whether settings can be adjusted so that all individuals who take the poll also see all the results (not just their own entries). Is that an option? Hi Shemaya! Currently, only admins can see poll results, but there is a request on the Wishlist to have poll results shown on the website: https://forums.wildapricot.com/forums/308932-wishlist/suggestions/33977695-to-show-the-poll-results-on-the-website . You can vote for this function to be added to our development list. We will try out the new poll feature. Do you have a suggestion for length or number of questions a poll should be limited to? It would be great to have an open ended option in the polls so we can ask for more details, such as "What would you like to see done differently at the next event"
Hi Kristen, Thanks for the feedback. We have a suggestion for this in our Wishlist: https://forums.wildapricot.com/forums/308932-wishlist/suggestions/34441972-free-text-answer You can vote for this function to be added to our development list.